Today this pretty square is one of the city's favorite hangouts. There are a plethora of restaurants, cafes and bars surrounding it, and almost all of them offer delicious fare. Hundreds of tables spill out from the restaurants into the plaza. The eateries themselves are housed inside oldbuildings of charming architecture. Buskers entertain you as you eat. But a long time ago during the infamous Inquisitions, the square was a place of execution and religious murder. The name of the square is taken from the Santo Domingo Church in the corner. Look at the church tower steeple and it might seem crooked. It is said the Devil himself shook down the tower right before its completion. And in the middle of the square you will see a rather lascivious monument - the statue of “Gorda” Gertrude by Fernando Botero. It is said that if you fondle one of the statues gigantic breasts, you will have long and fulfilling sexual relationships. After the establishments at this square begin to close around 1am at night, revelers usually move on to plaza de Santa Teresa. Drive or take a taxi to here from outside Old Town. A must for the old town. If you plan a walk though the old town don’t miss this spot. 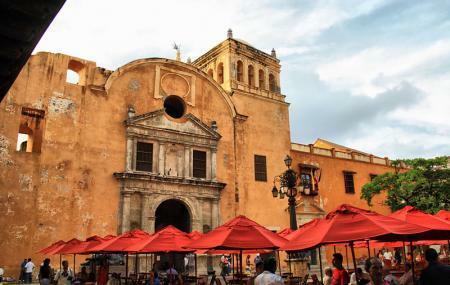 Beautiful Santo Domingo church and the statue “Gertrudis” by Fernando Botero are the main sights. It is believed that if you touch the statues breasts you’ll have lasting love relationships... bars and cafes are great places to take some time to appreciate this spot.